Details of the development of Probability theories in statistics are provided in Probability Introduction and Explanation Page , and their relationship to sample size in Sample Size Introduction and Explanation Page . This page provides only a quick summary to provide context for discussions regarding equivalence. In the 19th Century, Fisher developed the idea of Type I Error, based on the Normal Distribution, thus allows a probability estimate for whether the null hypothesis can be rejected. This allows decisions to be made in science and industry on whether a new product or process is better or worse than the current ones available. However, if the null hypothesis cannot be rejected, the researcher cannot draw any statistical conclusion, as a failure to reject null is not the same as an ability to accept null. A generation later, Pearson added the idea of Type II Error and the statistical significance, so that both the ability to reject and accept the null hypothesis can be made. Although this method was widely used in the twentieth century, it was increasingly criticised because results of research are often nor reproducible because of difficulties in determining the population Standard Deviation. To provide robustness to statistical conclusions, researchers increasingly used the 95% confidence interval of the difference, which is an intuitively easier to understand expression of the Type I Error, and to carry out power analysis, which makes no assumption about population parameters. The combination of these two approaches allows researchers to draw confident conclusions whether two sets of observations can be considered significantly different. However, the problem remains that a failure to demonstrate significant difference is not the same as to demonstrate similarity, and the ability to robustly demonstrate similarity is increasingly required, particularly in biomedical research. An example is in cancer treatment. The current treatment may have severe side effects, and a new treatment may have much more acceptable side effects, but the researcher needs to know whether the effectiveness in controlling the cancer is the same, or at least not inferior to the current treatment. If the 95% CI does not intercept the null value, as shown in the 1st and the 5th lines in the diagram, then a significant difference exists. This is true whether the 95% CI is calculated using the one or two tail models. If the 95% CI is on the left (diff<null), intercepts the null, but does not intercept the positive Critical Difference (CD) value, as shown in the 2nd line in the diagram, then group 1 is significantly not greater than group 2. This is true whether the 95% CI is calculated using the one or two tail models. 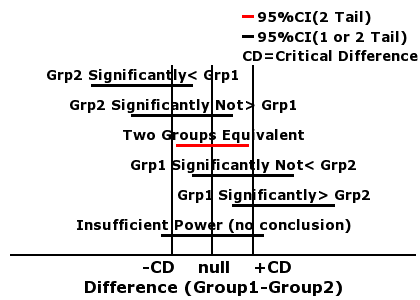 If the 95% CI is on the right (diff>null), intercepts the null, but does not intercept the negative Critical Difference (CD) value, as shown in the 4th line in the diagram, then group 1 is significantly not less than group 2. This is true whether the 95% CI is calculated using the one or two tail models. If the 95% CI is near the center, intercepts the null, but does not intercept either the negative positive Critical Difference (CD) value, as shown in the 3rd line in the diagram, then the two groups is significantly equivalent. This is only true if the 95% CI is calculated using the two tail models. If the 95% CI intercepts both negative and positive Critical Difference values, as shown in the 6th line in the diagram, then the data lack sufficient power to drawn statistical conclusions, usually because the variance is too large or the sample size not big enough. This is true whether the 95% CI is calculated using the one or two tail models. One tail or two tail In most text books and published papers, statistics related to equivalence uses the one tail model. This is because most equivalence related research are concerned with non-inferiority, so that not significantly greater or not significantly less are the hypotheses to be tested. As the one tail model allows these conclusions and requires smaller sample size, this is the model to use. StatTools however provides calculations for both one and two tails in case any user requires them. Sample size and power calculations for equivalence differ from those of significant differences in two ways. Firstly, the decision is based not only on the relationship between the difference between the two groups and the null value, but also the positive and negative critical values. Users should remember that good statistical practice requires the hypothesis to be tested defined at the planning stage, and statistical procedures are used to reject or support that hypothesis. A common malpractice of doing the statistical calculations first, then cherry pick the hypothesis according to how the numbers come together should be avoided. A study to test significant difference or equivalence, the direction of non-inferiority, whether the model should be one or two tail, must be determined at the planning stage before data collection and analysis. StatTools provides 3 algorithms for equivalence analysis. Bioequivalence opposite to mean of paired differences, with an addition to a commonly accepted protocol required by the FDA for testing biological equivalence between therapies. It is described in its own panel on this page, and calculations are provided in Bioequivalence (Sample Size and Analysis) Program Page . For equivalence to be validly established, the correct sample size must be estimated and used, and this requires 5 parameters. Probability of Type I Error (α). For equivalence, the value of 0.05 most commonly used, to be compatible with the 95% confidence interval. α of 0.1 and 0.2 are occasionally used in association with 90% and 80% confidence intervals of the difference. Ratio of sample sizes (φ = ngroup2 / ngroup1) to be used. In most clinical research the groups are of equal size (φ=1), but availability or clinical priority may require groups of unequal size. Please note the φ is calculated as ngroup2 / ngroup1). From these parameters, the program calculates the sample size for each of the two groups, in the one and two tail models. For most non-inferiority studies, the sample size for the one tail model is used. The two tail model is only required if the purpose of the study is to establish true equivalence, a confidence interval that is both significantly not less than the negative Critical Difference value, and significantly not greater than the positive Critical Difference value. Please note that the two calculations produces similar results when the sample size is large, but differs if the sample size is small. In most cases the two calculations lead to the same conclusions, but with data on the margin of statistical significance, confidence interval and power analysis may lead to different conclusions. The reasons are as follow. The confidence interval is the same as that calculated for comparing the differences between two means, assuming the data to be a sample, and calculations based on the t distribution. This is offered as it is the most common parameter for making statistical decisions, particularly that associated with the 95% confidence interval (α=0.05). Such a decision allows the interpretation for significant difference, significant non inferiority, and equivalence. The power calculation assumes the data to represent population values, so calculations are based on the z distribution. It estimates the probability of detecting the non-inferiority or equivalence at the level of α, if it is truly present. Most clinicians would be content to use the 95% confidence interval to decide whether equivalence exists or not. Statisticians however may wish for more nuance to determine the confidence of the decision, and use the power analysis. The data for the example is artificially created to demonstrate the statistical method, and not based on any real observations. We are offered two nutritional supplements for muscle building, supplement 1 is expensive, and supplement 2 is cheap. We would wish to use supplement 2 if it is not inferior (not building less muscle than supplement 1). We use weight gain over a period of time as the outcome measurement. We decided to use Probability of Type I Error α=0.05 and power=0.90. We anticipated standard deviation=1.5, Critical Difference =1.0, ratio of sample sizes φ=1, and the one tail model. The ratio CD/SD = 1.0 / 1.5 = 0.67. Looking up the table for sample size comparing two means, α=0.05, Power=0.90, CD/SD=0.67, the sample size required is 39 cases per group. After randomly allocated trial subject into the two groups for the two treatment (group q received supplement 1 and group 2 supplement 2), the weight gain obtained are as in the table to the right. These results, with α=0.05 and CD=1.0, are entered into analysis, and the results are as the next table to the right. Looking at the 95% confidence interval, if the conclusion that supplement 2 is non-inferior to supplement 1, the one tail 95% confidence interval of the difference (meangroup 1 - meangroup 2) must be from -∞ up to +1Kg (positive Critical Difference). The results of the calculation show that the 95% CI is from -∞ to +0.37Kg, not intercepting the positive Critical Difference. We can therefore draw the conclusion that group 1 is significantly not greater than group 2, and that supplement 2 is non-inferior to supplement 1. The data also allow us to draw the conclusion that supplement 1 is non inferior to supplement 2, if we had planned to test that hypothesis, as the one tail 95% confidence interval of the difference would then be -0.77Kg to +∞, not intercepting the negative Critical Difference value. We cannot use these two one tail confidence intervals to conclude that the two supplements are truely equivalent (similar or same), as this will require the two tail confidence interval, which is very much wider. The two tail confidence interval for the difference is -0.88Kg to + 0.48Kg, which allows us to conclude that both supplements are truly equivalent. To test the hypothesis that supplement is non-inferior to supplement 1, we test the power of the difference (meangroup 1 - meangroup 2) not greater than 1Kg., and the power is 0.97. We can therefore conclude with confidence that group 1 is significantly not greater than group 2, and therefore supplement 2 is non-inferior to supplement 1. Power analysis also allows us to test whether supplement 1 is non-inferior to supplement 2, had we planned to test this. The power for this is 0.76, short of the 0.8 required to draw such a conclusion, so the question of whether supplement 1 is non-inferior to supplement 2 remaqins unanswered with the current data sign. The power to test true equivalence requires the two tail model, and the two tail power is 0.66, very much short of the 0.8 required to conclude that the two means are equivalent. The expected proportion around which the two proportions are to be compared. Please note that the two calculations produces different results. In most cases they lead to the same conclusions, but with data on the margin of statistical significant, the difference may lead to different conclusions. The reasons are as follow. The confidence interval is the same as that calculated for comparing the difference between two proportions. This is offered as it is the most common parameter for making statistical decisions, particularly that associated with the 95% confidence interval (α=0.05). Such a decision allows the interpretation for significant difference, significant non inferiority, and equivalence. The power calculation is based on a difference calculated using the Maximum Likelihood Model. It estimates the probability of detecting the non-inferiority or equivalence at the level of α, if it is truly present. Please note the data in this example are artificially created to demonstrate the statistical procedure, and not based on any observations. The current chemotherapeutic agent for a particular cancer is fairly effective, with a 1 year recurrence rate of 20% (0.2). However it is rather toxic, producing unacceptable side effects such as marrow depression, infections, and severe nausea. A new agent has been produced, which has very little side effect, so that it would obviously be preferable, providing the cure rate is non-inferior. In statistical terms, the 1 year recurrence rate for the new agent should be significantly not higher than the old agent. With variations in observation, we feel that a 20% (0.2) difference in recurrence rate is tolerable statistically, that we accept that the new treatment is non-inferior if the recurrence rate is less than 40% (0.4), so we set our critical difference to 0.2. We will use α=0.05 to follow the convention of 95% confidence interval, and power (1-β) of 0.9. We randomly allocated patients to receive the two agents. Group 1 receive the new agent, and group 2 the old. At the end of data collection, we obtained the following results. The results of analysis are as shown in the next table to the right. The recurrence rate for group 1 (new agent) is 22.5% (0.225) and for group 2 (old agent) is 19.7% (0.197). The difference is 2.8% (0.028). As the hypothesis to be tested is whether the new agent is non-inferior to old agent, so we choose the 95% confidence interval for one tail -∞→14.1% (0.141), which does not cross the positive Critical difference of 20%. We can therefore conclude that group 1 is significantly not greater than group 2, so the new agent is non-inferior to the old agent, in terms of one year recurrence rate. The power estimation for group 1 not greater than group 2, using the one tail model, is 0.8, which is less than the 0.9 planned but still marginally acceptable statistically as having sufficient power. The same conclusion as that from the 95% confidence interval can be drawn, but with a little less confidence. Bioequivalence is used mostly in the pharmaceutical industry, particularly by regulatory bodies such as the FDA. The definition provided by the FDA is as follows. "Bioequivalence means the absence of a significant difference in the rate and extent to which the active ingredient or active moiety in pharmaceutical equivalents or pharmaceutical alternatives become available at the site of drug action when administered at the same molar dose under similar conditions in an appropriately designed study". Depending on the problems and situations confronting the investigator, two research models can be used. The preferred model is the cross over trial, where each test subject is administered both the reference and test agents (pharmaceutical alternatives). The variability to be used for sample size estimation and analysis is the within-subject variability. Usually, this means a known and accepted reference Standard Deviation for repeated sampling in the same individuals, or the pooled within subject Standard Deviation from a previous or current trial. The parallel trial, where the reference and test agents (pharmaceutical alternatives) are randomly allocated into two equal size groups of subjects. The variability to be used for sample size estimation and analysis is the total variability, including within-subject and between-subject variability. Usually, this means a known and accepted reference population Standard Deviation or the pooled Standard Deviation of the reference and test groups combined. The appropriate sample size is calculated and adhered to. A clearly defined protocol of allocation to groups or order of administration, control of dosage and environment, and collection and recording of data are adhered to throughout. More commonly the logarithmic transformation of r is used, so that log(r) = log(meantest / meanreference) = log(meantest) - log(meanreference). if log(r) is between -0.22 (log(0.8)) and 0.18 (log(1.2)), Bioequivalence is accepted. The ratio of Critical Difference and mean, represented by Omega Ω = CD / mean. The FDA recommends 0.2 (20%), so this is usually the value used for this parameter. Sample size (per group in 2 group parallel study or number of cases in a cross over study) is then calculated using α, power, CV, and Ω. Although the program calculates sample size for both the one and two tail models, the one tail sample size is almost universally used, as the major concern is that the test agent is non-inferior to the reference. The Coefficient of Variance CV = Standard Deviation / Mean. Under the current FDA guidelines, a difference between the test and reference mean that is less than 20% of the reference mean is accepted as Bioequivalence. This value can be represented in 3 expressions. A power estimation is also carried out, to make sure that the data has sufficient power (power>=0.8) to draw confident conclusions. Power calculation is based on Probability of Type I Error α (usually 0.05), and the two parameters CV and Ω calculated from the data. In nearly all cases, the one tail power is used. Two sample size tables for Bioequivalence are presented in the next two panels. The full sample size table provides sample size for powers of 0.8, 0.9, and 0.95, α of 0.1, 0.05, and 0.01, Coefficient of variance from 0.02 (2%) to 0,5 (50%), Ω from 0.02 (2%) to 0.3 (30%), and for one and two tails. This table therefore provides sample size for all conceivable circumstances where Bioequivalence is to be analysed. Sample sizes are left out if it is less than 4 or more than 10,000. Sample size or odd number CV and Ω can be estimated by extrapolation between adjascent cells in the table. The short sample size table is a subset of the full table, and contains sample size for Bioequivalence studies under the FDA guidelines. Sample sizes are for powers of 0.8 and 0.9, α of 0.05 and 0.1, CV from 0.05 (5%) to 0.5 (50%) at 0.1 intervals, Ω of 0.2 (20%) and one tail only. This is a much smaller table, but should contain the sample size required under the FDA guidelines. Please note that the numbers of this example are computer generated to demonstrate the statistical procedure, and are not based on any observations. We know, from repeated studies in the past that 2 hours after a standard Intramuscular dose of penicillin, the blood level has a mean value of 50 miliunits per ml (mU/ml), with a Standard Deviation of 7.5 mU/ml. Now that the patent for penicillin has expired, a company has produced a new preparation of penicillin, and seek FDA's licence for commercial development. To obtain this the company needs to show that its preparation (test) is Bioequivalent to the current accepted preparation (reference). We are asked to help establishing this. We established from published data that the standard response blood level (reference mean) is 50 mU/ml, and Standard Deviation is 7.5mU/ml. From this the Coefficient of Variance CV = 7.5 / 50 = 0.15 (15%). We adopted the commonly used α=0.05, and power=0.9, and the FDA recommended Ω=0.2 (20%). Using the short table from previous panels, we decided that the sample size should be 15 cases per group. We decided to use the cross over design. We recruited 15 subjects, and administered to each subject both the standard (reference) and our new (test) penicillin, using the same dosage and administration, but two weeks apart in order to avoid residual levels. Our subjects receive the two preparation in random order, using a random number table. Blood is taken 2 hours after administration and the concentration of penicillin measured. We can therefore conclude that Bioequivalence is demonstrated between the test and reference preparations. We can therefore be confident that the sample size for the data was indeed adequate for the study.